reprise des ventes de gold et silver eagles : l'intéret des investisseurs pour le physique ne se dément pas ! silver eagle à nouveau en rupture de stocks ! On the first day of availability for 2013-dated Silver Eagles, authorized purchasers had placed orders for 3,937,000 of the one ounce coins. This seemed to mark the highest one-day sales in the entire history of the program. The strong demand has continued with sales now having reached 6,007,000 according to the latest information posted on the Mint's website. Rien qu'au vu de ces 2 graphes, il ne vous aurra pas échappé que la demande pour ces pièces est robuste ... et que celle des silver eagles surpasse de très loin celle des gold eagles . Confirming this strain on physical silver supplies, just this morning the RCM (Royal Canadian Mint) went on allocation, limiting the quantity of sales of the popular silver maple leaf coin. So now the silver shortage has spread across the continent. Both dealers and wholesalers are reporting that the supply on maple leaf silver coins is now weeks backlogged. La Casa de Moneda de México (the oldest mint in the Americas) is the only mint in North America left with full supply of 2013 silver coins as of this point. Please note that many dealers still have supply, but this recent shift to allocation may signal an imminent shortage similar to the one seen on US Mint Silver Eagles. There are only a handful of primary distributors and they are seeing less silver inventory available from the Mints, as physical demand has skyrocketed lately. This has been driven by concerns over the fiscal cliff, debt ceiling, worldwide currency debasement, unprecedented levels of stimulus and money printing and political leaders that are unwilling to slow their appetite for deficit spending. those desiring to own gold. en voilà une révélation ! - US Mint, c'est le gouvernement US, et ce gouvernement est un client de JPM et HSBC : vous avez dit, conflit d'intérêt??? - de surcroit, les 2 banques disposent ainsi d'informations privilégiées sur la demande, ainsi qu'une couverture officielle ( sans jeu de mots ) à une activité de vente à découvert pour le compte de clients. Le save act II est un projet de loi qui propose d'interdire la production de pièces dont le cout de production est supérieur à la valeur faciale des pièces produites. Si ce projet a pour but de cesser la production des pieces métalliques en circulation ( notamment le 1 cent en nickel ), il pourrait avoir de facheuses conséquences sur la production des silver et gold eagle dont la très faible valeur faciale n'a plus rien à voir avec leur coût de production ! "The United States Mint will issue its last weekly allocation of 2013 dated American Eagle Silver Bullion coins on Monday, December 9, 2013. We will begin accepting orders for 2014 dated American Eagle Silver Bullion coins on Monday, January 13, 2014." Silver supplies will tighten and silver premiums will rise industry wide. 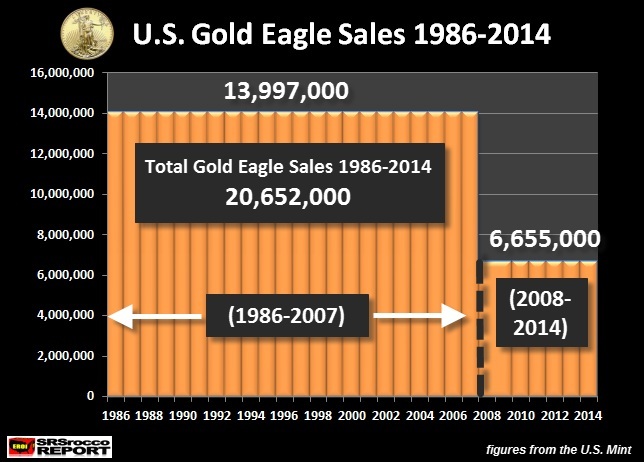 Throughout 2013, the U.S. Mint has been narrowly meeting the public's silver eagle coin demand. As a matter of fact, the U.S. Mint is about to break its 2011 all time record of 39,868,500 American Eagle Silver Bullion coins sold. Being that today is November 1, 2013... we are only 83% of the way through 2013's calendar year. 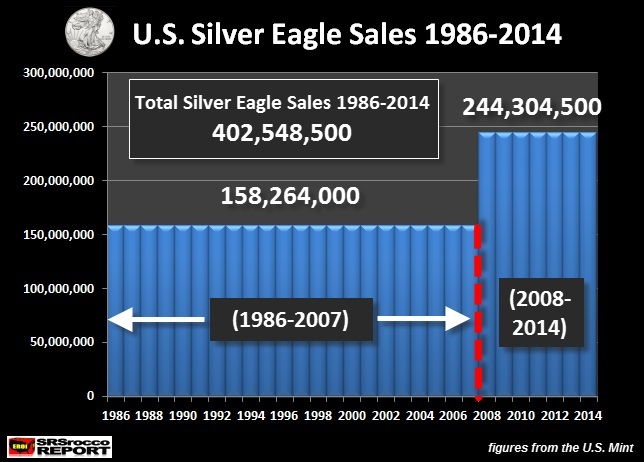 Officially 39,175,000 silver eagle coins have sold thus far in 2013. The 2011 sales record will officially fall some time next week. Silver Eagle Coin cupboards are currently low. As it stands now, the vast majority of high volume silver dealers are not sitting on hoards of fresh 2013 U.S. Mint Silver Eagle coins. 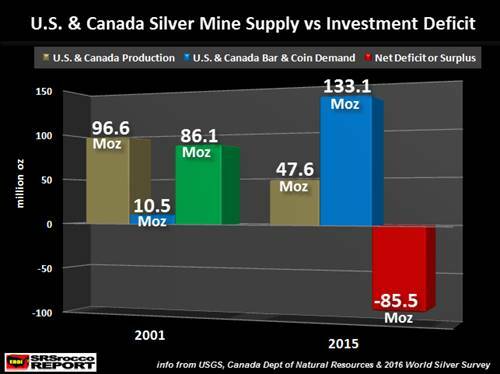 The upcoming 35 day silver eagle coin hiatus will most likely produce a shortage of the world's most popular silver bullion investment vehicle and thus... produce a growing shortage of other silver bullion products as a consequence. What should you do about this breaking news? If you ( like us ) are an active buyer in the bullion market today, it behooves you to get ahead of Holiday Bullion Shortage Shoppers and acquire your stacks of silver and gold while premiums remain reasonably low. In 2013, investors watched as the US Mint broke record after record for American Eagle silver coin sales, eventually selling 42,675,000 of the coins, 26 percent more than it sold in 2012 and a new yearly record. January 2012, with 6,107,000 coins sold. The March total brings 2014 first-quarter sales of the coins to 13,879,000, states CoinNews. Last year is the only time sales during that period have been better. Shedding some light on why American Eagle silver coins sold so well in March, Sprott Money Blog identifies low silver prices caused by the US Federal Reserve’s statement that it ”may consider raising interest rates sooner than previously expected” and the “ongoing slowdown in China” as two potential catalysts. The “increasingly precarious situation that the world finds itself in due to rising tensions over the Russian-Crimea crisis” is also driving physical silver demand, the publications states in another article. What’s more interesting is the fact that sales of the coins could have been even higher. That, as Coin Update points out, is because the Mint is rationing its American Eagle silver coin sales, a move prompted by its “inability to source sufficient precious metals blanks.” Further, according to Sprott Money Blog, this year the Mint did not start selling the coins until the second week of January. As a result, states CoinNews, while figures from the US Mint are helpful in providing an understanding of physical silver demand, they cannot paint a full picture. Due to the REQUIREMENT of the US Silver Eagle law, the US Mint must produce coins “in quantities sufficient to meet public demand” which puts the US Mint is in the unique position among all the other buyers of silver blanks as being REQUIRED to be the HIGHEST BIDDER for silver blank production when global supplies of US Silver Eagles are NOT meeting demand. 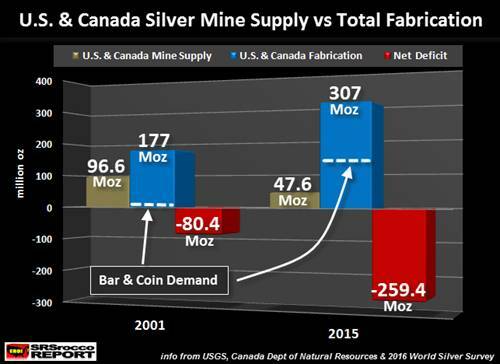 By holding back the higher bids for physical silver the US Mint is participating in the price suppression that has distorted the supply/demand dynamics for a “free market” in silver which has created the shortages of physical silver. It is disingenuous for our politicians and regulators to decry the widespread use of artificial market manipulation on one hand – and play a major role in supporting it on the other.